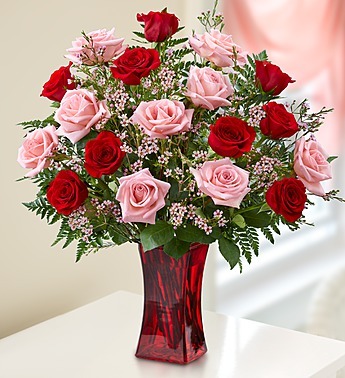 EXCLUSIVE She'll be blushing for sure when our beautiful bouquet of pink and red long-stem roses arrives at the door! Hand-gathered with love by our expert florists in a rich red vase, we can’t think of a more colorful way to express yourself to someone very special. Add our romantic Valentine's key necklace for another romantic surprise.